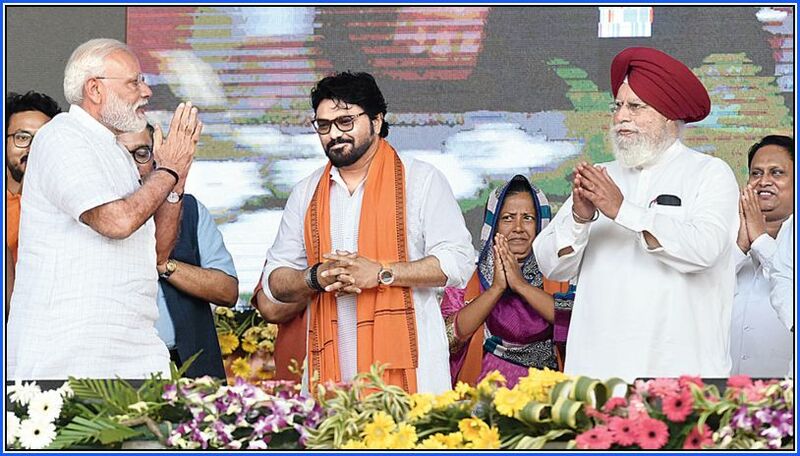 Sitting Darjeeling BJP MP S.S. Ahluwalia did not attend Narendra Modi’s public meeting in Siliguri but was present at his Calcutta rally, with some linking the absence to an outcry over his recent “born in Nepal” swipe. Asked about demands in the hills for a son-of-the-soil candidate for the Darjeeling seat, Ahluwalia had last month said some people in the hills “were born in Nepal”. The comment drew fire from the Binay Tamang faction of the Gorkha Janmukti Morcha and ignited demonstrations against the MP in the hills. “Moreover…. Raju Bista (the new Darjeeling BJP candidate) should be present and he was there at the meeting….I did not want to overshadow him,” Ahluwalia added in a humourous tone. Some felt there was more to his absence. “Ahluwalia’s remarks had left BJP leaders here in an awkward position as some hill parties and organisations said the BJP should clarify whether it endorses such comments. This might be one of the reasons he (Ahluwalia) attended the rally in Calcutta and not in Siliguri,” said an observer. Earlier, the Gorkha National Liberation Front and a section of the Morcha had protested the prolonged absence of the BJP leader and Union minister from the hills during and after the statehood agitation of 2017. The parties complained that he had not taken any initiative, nor intervened, to improve the situation then. The GNLF had filed a “missing diary” with police in Ahluwalia’s name to embarrass the MP. This time, the GNLF has backed Bista, the new BJP candidate. Getting the GNLF as an ally, along with the Bimal Gurung faction of the Morcha, has fired the BJP’s hopes of shoring up support. Until a few months ago, the BJP could not hold programmes in the hills as anger at the party and the MP simmered. “GNLF leaders and supporters were there (at Modi’s Siliguri)) meeting in large numbers. It seems the BJP played strategically and did not take any risks,” the observer said. In Calcutta, Ahluwalia was seen on the Brigade dais with Modi. He was among the first of the senior BJP leaders to arrive and among the last to leave after the event. He was part of the photo-ops at the start of the rally but when he apparently approached the Prime Minister for talks, it did not take place. Sources in the BJP state unit said the Bengal-born Ahluwalia, who “opted out” of the Darjeeling seat, was vying for a ticket from the Burdwan-Durgapur constituency. “Our candidates are yet to be announced for two Bengal seats, Burdwan-Durgapur and Purulia. Ahluwalia wants a ticket from Burdwan-Durgapur. He wanted to speak to Modiji about it at the Brigade. But that conversation did not take place,” said a BJP functionary.